LAPP’s TC-ER rated cables allow you to run cable outside of the tray without requiring a protective conduit, as long as the cable is secured every 6 feet. TC-ER cables eliminate conduit requirements, which reduces installation costs by saving time and materials. This also provides more flexibility when installing cable in an industrial environment. 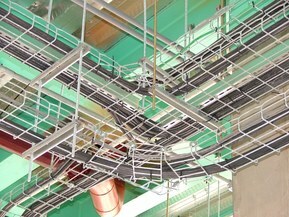 In industrial establishments where the conditions of maintenance and supervision ensure that only qualified persons service the installation and where the cable is continuously supported and protected against physical damage using mechanical protection, such as struts, angles or channel, Type TC tray cable that complies with the crush and impact requirements of type MC cable and is identified for such use with the marking type TC-ER shall be permitted between a cable tray and the utilization equipment or device. The cable shall be secured at intervals not exceeding 1.8 m (6ft). Equipment grounding for the utilization equipment shall be provided by an equipment grounding conductor within the cable. For more information on each LAPP TC-ER rated cable, please contact one of our sales team specialist at 800-774-3539 or sales@lappusa.com.